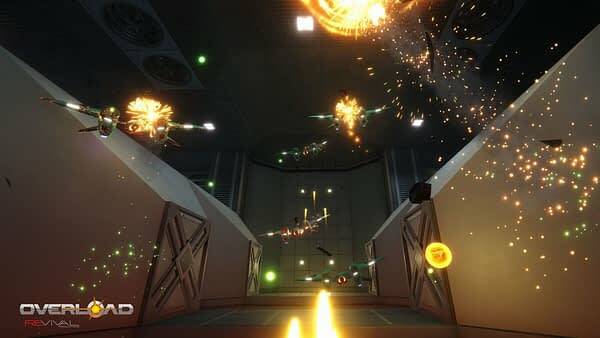 Revival Productions has announced that their six-degree-of-freedom tunnel shooter Overload will launch on PC for Windows, Mac, and Linux on May 31st. The game will retail for $34.99 USD. The PlayStation 4 and Xbox One versions of the game will release in Q3 2018, likely in September or October for that pre-Holiday rush. The game was developed by the creators of the critically acclaimed ’90s classic Descent, so fans of that game should have some idea of what to expect from Overload. Developer Revival Productions was founded by Matt Toschlog and Mike Kulas, who were both co-founders of Parallax Software. Overload will be the first game produced by Revival. It’s designed to be a combination of typical modern FPS improvements with that classic 6-DOF gameplay Descent was known for. A “playable” teaser of Overload is available for free on Steam or by direct download. And of course, there’s an announcement trailer for you that you can watch below.